We had a fun day celebrating America! Our day started with a parade. 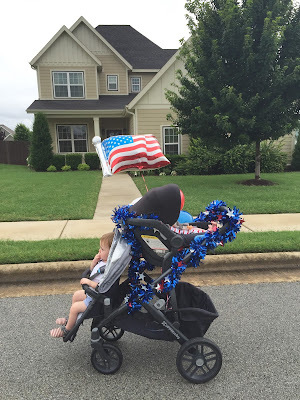 We decorated our stroller, put the boys in some red, white and blue, and made the lap around the neighborhood! It's fun participating in the parade and Campbell always enjoys getting in on the action. After the parade we went to the pool to swim and eat hot dogs with our neighbors. 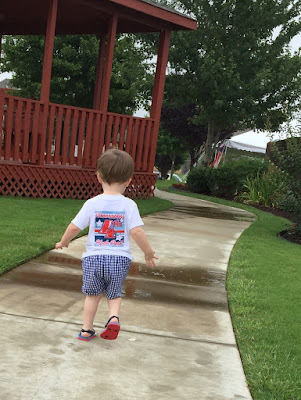 Campbell is loving the pool this summer and can't seem to get enough of it. He threw the biggest fit once it was time to leave (of course) and take a nap. His fit throwing wore both Scott and I out so we decided to take a nap ourselves while the boys napped. Once they woke up, we sat on our driveway and let Campbell play with pop rocks for the first time. He loved it and kept saying "I did it! I did it!" After we ran out of pop rocks, we walked a few houses down to our friends to play with sparklers and watch our super awesome neighborhood firework show. 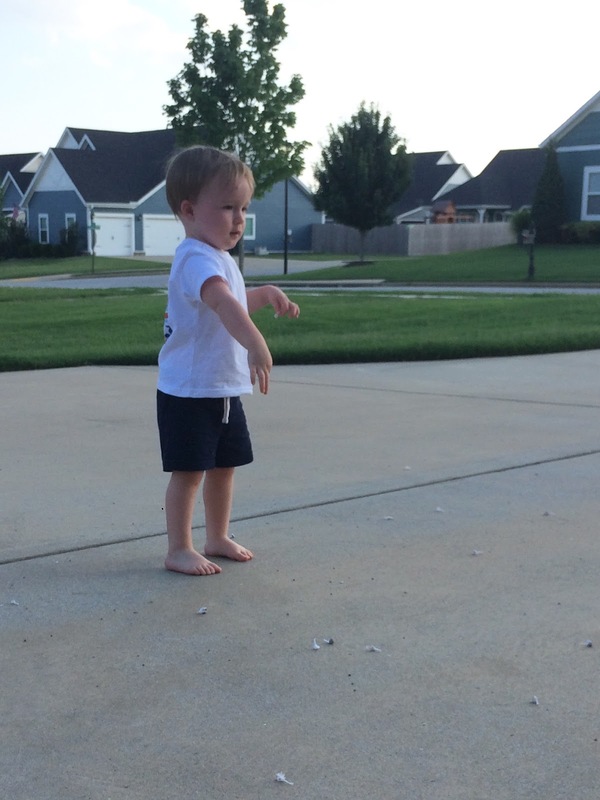 We decided to let Campbell stay up WAY past his bedtime to watch the fireworks because why not? At about 10 PM we called it a night. It was a really fun day!! Campbell had a blast and Bennett was a trooper. Bennett didn't have ideal napping conditions (he's really starting to prefer naps in his crib these days) but he let us have fun while he took a lot of naps in the stroller. Overall, a fun filled day. We love celebrating America! !